DemDaily: Your Guide to the Democratic National Committee! 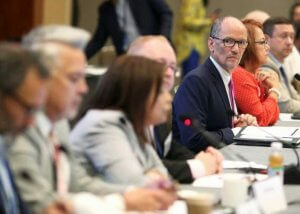 The Democratic National Committee meets in Washington, DC this Thursday through Saturday for its Winter Meeting to discuss organization and strategy leading up to the 2020 presidential -- only 629 days away! DemList will keep you posted on developments from the Capitol City, but for those uninitiated to the ways of the Party, we start with A Primer! The Democratic National Committee (DNC) is the formal governing body for the Democratic Party. Founded in 1848, the DNC is now the longest running political organization in the world. The DNC is responsible for establishing and promoting the Democratic party principles, and coordinating strategy and activity to support the election of Democratic candidates at the local, state, and national levels. It organizes the Democratic National Convention, held every four years to nominate a candidate for President, and formulates the party's official platform. In presidential elections the DNC may coordinate certain campaign expenditures with the nominee's campaign, but independently raises its own funds for staff, party-building activities and political operations. The DNC is led by a team of national officers who are elected by members of the DNC every four years. Internally the DNC's agenda, rules and operations are governed by a series of Committees including the Rules and By-Laws, Budget & Finance, Credentials, Resolutions and Platform Committees. There are 447 DNC Members who are elected or appointed as delegates to a four-year term from five categories. Some are elected on the ballot as part of the state's Democratic primary, and in other states the members are elected by the State Democratic Committee or the State Convention. Membership is equally divided between men and women. * State-Elected (200 members). Based on population, a minimum of two from each State, the District of Columbia, the Territories and Democrats Abroad. State processes vary, but most are elected by the state's Democratic Committee, at the State Party Convention or Democratic Primary. * Current and former Democratic Presidents, Vice Presidents, Governors and Members of Congress. * Official Party Committee Representatives from affiliated Party Committees that provide resources and focus on electing, and reelecting, lawmakers at specific levels of office. They include: The Democratic Senatorial Campaign Committee (DSCC), Democratic Congressional Campaign Committee (DCCC), Democratic Governor's Association (DGA), Democratic Legislative Campaign Committee (DLCC), National Conference of Democratic Mayors (NCDM), Democratic Municipal Officials (DMO), National Democratic County Officials (NDCO), Democratic Association of Secretary of States (DASS), Democratic Attorneys General Association (DAGA), National Association of Democratic Lieutenant Governors, National Association of Democratic State Treasurers, National Federation of Democratic Women, College Democrats and Young Democrats. * At-Large Members: 75 individual members representing different constituencies and leaders "at-large" who are nominated by the DNC Chair and approved by a vote of DNC members. 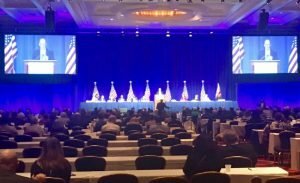 Under the new rules adopted at the 2018 Summer Meeting, DNC members are convention delegates, but do not have a vote on the first ballot in the Democratic presidential nominating process. However, if the nomination fight goes to a second ballot, then they may cast a potentially decisive vote at that time. Over the course of three days, DNC members will participate in caucus, council, and committee meetings, as well as training sessions. The caucus meetings and Saturday's general session will be open to the press and the public. The DNC has two types of Caucuses: Regional, which represent the Eastern, Mid-Western, Southern and Western US, and Constituency, which include Asian American and Pacific Islander, Black, Hispanic, LGBT, Native American and Women. Regional Caucuses elect officers and four representatives to serve on the DNC Executive Committee. DNC Councils: Created to represent certain communities and are organized around an issue or cause, including: Disability, Labor, Interfaith, Vets & Military, Rural, Small Business, Ethics, Youth & Seniors. One of the hot topics will be the announcement of the location of Democrats' 2020 Convention, scheduled for July 13th-16th, and down to Milwaukee, Houston or Miami. connecting the Democratic family. SignUp today.